Jackson Police select February 2019 Employee of the Month. 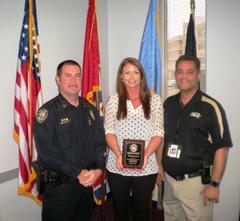 The Jackson Police Department is pleased to annouce Kelly Gregory as February "Employee of the Month." Kelly has been employeed with the Jackson Police Department for approximately nineteen years and is currently assigned to the Special Operations Division as an Executive Secretary for Metro Narcotics. Kelly has made her place at the Jackson Police Department as someone who has experience in various areas of the department. She has worked hard in reaching her goals. Ms. Gregory has worked in Central Records and she has even tried her hand at being a Police Officer. Ms. Gregory does an outstanding job for the Special Operations Division. She performs her assigned duties and responsibilities and goes above and beyond to assist in other duties. She has spent endless hours assisting the unit with handling paperwork while backing up the other two civilian personnel assigned to the unit. Kelly is a professional and she conducts herself as such. Though she dedicates herself to the Jackson Police Department, she makes time to for her daughter and their two dogs. Kelly is also a loving daughter who takes time to care for her ailing father who is a retired Investigator from the Jackson Police Department.